It is often said that you can’t break the rules unless you know what those rules are in the first place. There is no substitute for a good grounding in ‘academic’ drawing, and no discipline is better than the life-drawing room, with portraiture an even more exacting practice. But the life room can be a daunting place for some. Anyone can set up a simple still life, and with the most rudimentary materials, have a go. It is a way of learning to see the world around us, and the more practiced you become at it, the more you will ‘notice’ how things really are. It’s about taking time to look, and I mean really look. For me it’s 90% looking and 10% action as once I’ve started, the initial stages get ‘mapped’ out very quickly. There is no substitute either for working directly in front of your subject, be it a still life, or an outdoor view, but many artists work from memory alone, concentrating instead on a personal experience or feelings about objects or a given place. Here are some things to consider: Notice how edges are defined: are they all in sharp focus, or are some edges blurred? Is the composition balanced or lop-sided? Is there a natural movement through the composition? What colours stand out? What is the overall ‘hue’ colour? How does each colour affect it’s neighbouring colour? Where are the high and low notes in tonal values? 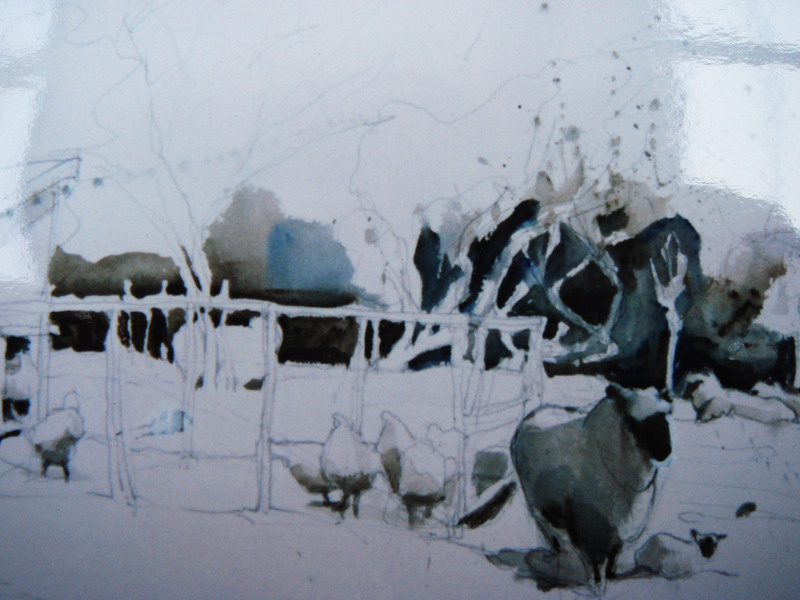 ‘Lamb’ is a quick drawing I did in situ, attracted by the contrast between the dark trees in the background seen through the enclosure fence.